For further discussion of vibrational and thermochemical analysis, see Sec. Vibrational and Thermochemical Analysis. frequency() is the only command most users will ever need to access directly to perform frequency calculations. Behind the scenes, frequency() is a light wrapper over hessian() that computes the Hessian then adds a thermochemical analysis. Function to compute harmonic vibrational frequencies. float – Total electronic energy in Hartrees. Indicate to additionally return the Wavefunction calculation result as the second element (after float energy) of a tuple. Arrays of frequencies and the Hessian can be accessed through the wavefunction. Indicates the type of calculation to be performed on the molecule. The default dertype accesses 'gradient' or 'energy', while 'cbs' performs a multistage finite difference calculation. If a nested series of python functions is intended (see Function Intercalls), use keyword freq_func instead of func. Indicates whether analytic (if available- they’re not), finite difference of gradients (if available) or finite difference of energies is to be performed. \(\Rightarrow\) -1 \(\Leftarrow\) || 1 || 'b2' || 'App' || etc. Indicates which symmetry block (Cotton ordering) of vibrational frequencies to be computed. 1, '1', or 'a1' represents \(a_1\), requesting only the totally symmetric modes. -1 indicates a full frequency calculation. Analytic hessians are only available for RHF. For all other methods, Frequencies will proceed through finite differences according to availability of gradients or energies. Function complementary to frequency(). Computes force constants, deciding analytic, finite difference of gradients, or finite difference of energies. Matrix – Total non-mass-weighted electronic Hessian in Hartrees/Bohr/Bohr. (Matrix, Wavefunction) – Hessian and wavefunction when return_wfn specified. It’s handy to collect the wavefunction after a frequency calculation through e, wfn = psi4.frequency(..., return_wfn=True) as the frequencies can be accessed through psi4.core.Wavefunction.frequencies(), the Hessian through psi4.core.Wavefunction.hessian(), and much other computation info through psi4.core.Wavefunction.frequency_analysis (note no parentheses). Examples of using this data structure can be found fd-freq-gradient and python/vibanalysis. Formatted printing of vibrational results is available through qcdb.vib.print_vibs(). 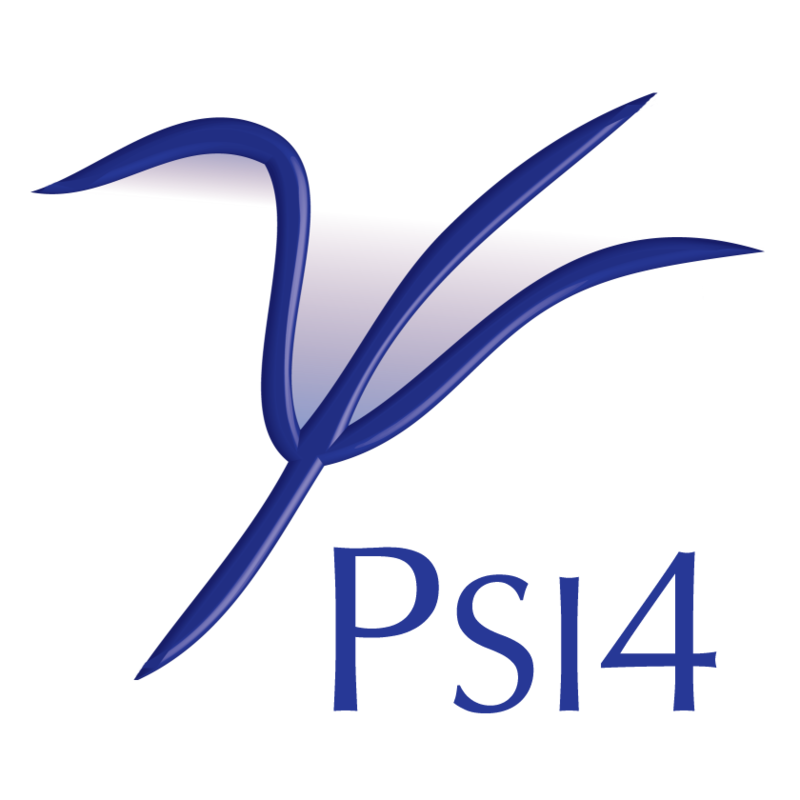 PSI4 has the ability to export a Molden file that stores information about the harmonic frequencies and normal modes computed via frequency(). This feature can be enabled by setting the option NORMAL_MODES_WRITE to true. The filename of the Molden file ends in .molden_normal_modes, and the prefix is determined by WRITER_FILE_LABEL (if set), or else by the name of the output file plus the name of the current molecule. The normal coordinates saved in the Molden file are normalized and are not mass weighted. Do write a file containing the normal modes in Molden format? If so, the filename will end in .molden_normal_modes, and the prefix is determined by WRITER_FILE_LABEL (if set), or else by the name of the output file plus the name of the current molecule. Base filename for text files written by PSI, such as the MOLDEN output file, the Hessian file, the internal coordinate file, etc. Use the add_str_i function to make this string case sensitive.